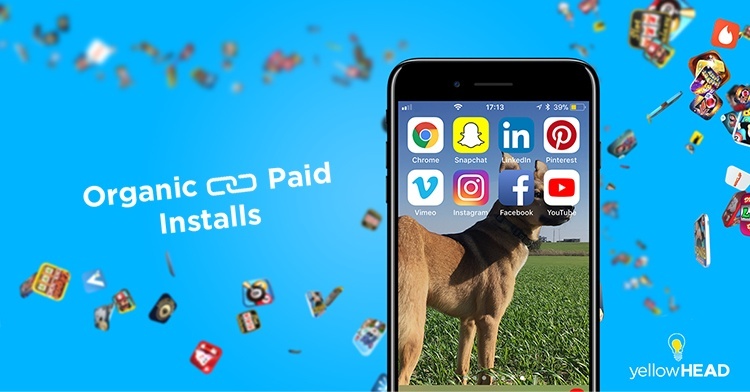 Much has been written about the relationship between paid and organic installs and whether the former has any sort of impact on the latter. In one word, yes. There is a correlation between the two funnels and it even has a name: The K factor. The K factor refers generally to many types of relationships within the marketing industry, but for our purposes we will define it as the relationship between paid and organic installs. As mentioned above, the K factor has been explored and tested, with the very informative post by Adjust as a prime example. The article explored the relationship of installs by traffic source over a span of 50 weeks for 1000+ apps sorted by categories. The results implied that the more ‘popular’ an app is, the greater the impact of the K-factor, whereas smaller and less popular apps won’t see as high an ROI when investing in paid acquisition. Mainly it comes down to a strong, steady base of organic installs – whether from sharing or search or browse. So, a rise in paid installs will result in a greater increase in organic installs than would be the case for a less popular app. This theory makes sense since an app with more exposure has a greater potential to yield organic traffic. A boost in that exposure works on a much greater scale for bigger brands, since there is already a massive starting point. This begs the question then, where does that leave App Store Optimization? To answer this, we need to understand the context within the greater marketing strategy for the app. Namely, how much of the strategy has been dedicated to branding? It all starts with the brand. The marketing strategy rests on the notion that there is a product involved, and the assumption is that the product is likely to be popular and, thus, profitable. The more popular a product becomes, the more exposure it gains and the more likely a consumer is to recall the brand (do you recall the widely popular game “Logo Quiz”?) when it comes to acquiring the product. The classic example – a consumer is more likely to choose Coca Cola over an off-brand soda. This process translates to the mobile world as well. The more popular an app is, the more widely it is seen and heard, and the user is likely to prefer it the next time he or she is looking to install an app (e.g. choosing Tinder over a generic dating app). In ASO, the search popularity of brand names as keyword queries makes this all the more evident. In fact, a study has shown that most users install an app after being exposed to the brand in the past. Therefore, when a large app/brand invests in a marketing campaign, it is likely to be effective in driving organic installs on top of non-organic installs, thereby increasing the volume of total installs and ultimately placing the app in a higher position in the category ranking (since the placement of category ranking is mainly based on volume of installs). So how does ASO fit into big branded marketing strategies? It’s a matter of making sure the page is synched with all marketing efforts, in addition to maintaining a steady number of installs by running frequent A/B tests. With bigger brands, our ASO approach tends to focus more heavily on conversion optimization of the app store listings, as well as full localization of the app store listings for all relevant markets. The above study revealed that there is a minimal K factor with smaller apps that have lower volume of installs overall. This has some logic as well, since higher install volumes translate into more visibility in the app stores. Category rankings and featuring are more prominent with apps that have higher install volumes, leading to even greater organic exposure from within the store. While it may seem, at first, like the cards are stacked against small apps, this leaves a huge opportunity for ASO to step in. ASO is the ultimate tool for apps that don’t have a strong brand (yet) for whatever the reason (be it a new app, a redesigned app or anything else). If we assume most installs are attributed to brand recognition (70% according to mpire), the remaining 30% of undecided users/installs are up for grabs. With proper ASO targeting and testing, smaller apps can increase their organic installs volume. By targeting and optimizing for the relevant and highly-searched keywords in the different platforms, the apps become more discoverable in more search queries. Furthermore, when an app store listing is properly optimized with ASO A/B testing, a healthy Paid User Acquisition strategy will also benefit, as visitors from both paid AND organic traffic will convert better. With a consistent stream of paid and organic traffic, the ASO conversion optimization can be more effective in lowering overall CPAs. Bottom Line, how important is ASO? To put it simply, ASO is very important. However, it is also important to understand the degree of its effects, which varies from app to app depending on popularity. A proper ASO strategy for an app with a strong brand will help make sure the app stays relevant and competitive in its category, optimize for conversion from all traffic sources, and include localization for applicable geos. Meanwhile, a smaller lesser-known app can benefit from the optimization process with the intent of making the K factor as effective as possible. By optimizing listings for many relevant keywords, increasing CVR and, ultimately, increasing the app’s exposure, the app’s overall installs will start a more progressive climb. That said, it is important to remember that ASO won’t thrive in isolation. Like any good marketing strategy, ASO requires a healthy UA component to reach full potential in boosting overall installs, reducing CPA and improving ROI.